[SOLVED] Why isn&#39;t the circumferential light around the M87 black hole&#39;s event horizon symmetric? After the revelation of the first black hole images, it seems there is a bias towards the south side. Is it because of measuring it from earth or is it something more fundamental in the understanding of gravitation? My original answer below is wrong, see the correct answer of Rob Jeffries. The author of the OP 0x90 asked me to not delete this answer and instead explain why it was wrong. Perhaps this can be a teachable moment in how the EHT pictures can be misinterpreted. This is because of the tilt of the accretion disk with respect of our line of sight. The accretion disk is "in front" of the black hole in the southern part of the image. There is a number of other effects at play, though. You see only a narrow frequency band, so once the light is shifted by the Doppler effect to a different wavelength in either direction, or when the plasma has the wrong temperature, you stop seeing it in the image. 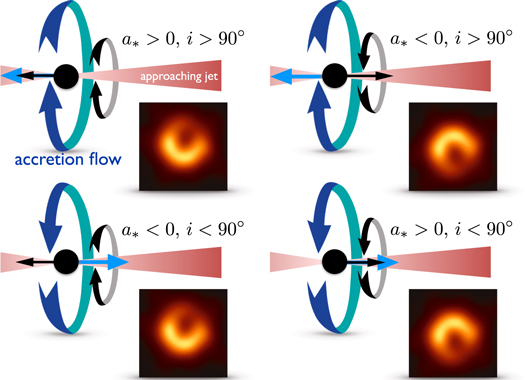 An additional general-relativistic effect is a "space-time push" the rotation of the black hole gives to co-rotating photons, which causes a slight west-east asymmetry in the image as well. As already noted, the what we see in the EHT image reconstruction is not just any image, it is a representation of the strength of a radio signal at almost exactly 1.3 mm in wavelength. Even though it is rendered in yellow to orange color for intuition, it is not an ordinary image of an object over a continuous spectrum and the radiation of the plasma ends up being much more directional and specific than you might usually expect. Another ingredient that greatly complicates the understanding of the image are relativistic effects. For example, often the emission from behind a black hole turns out to outshine anything in front of it! Even judging a slightly blurred numerical simulations without additional knowledge requires a great deal of direct experience with the problem. The crucial mistake I made was the assumption that the image would always be rotated so that the assumed spin axis is pointing north. This is how every numerical simulation result is presented and I have been fooled by doing too much theory to think differently. 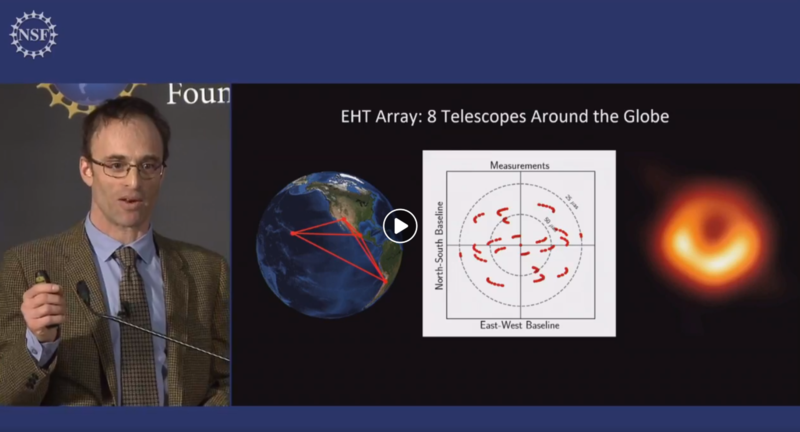 Naturally, if they do not even know where the spin axis is pointing and have at best a blurry idea, it is better to plot with respect to a standard system of celestial coordinates, which happened in the EHT image. Now let me expand on Rob Jeffries answer to contribute to the picture of how the image emerges. 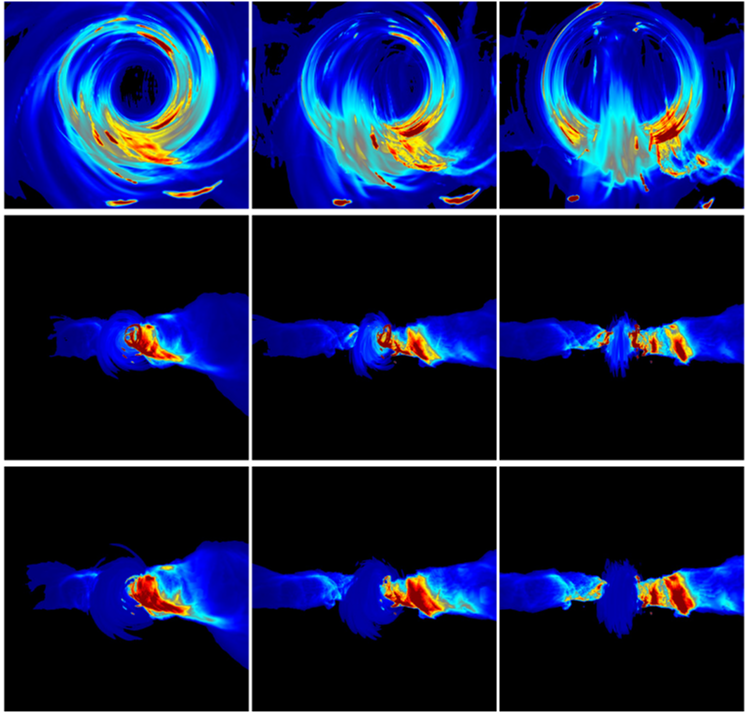 I extracted and rotated this picture from simulations of Monika Mościbodzka and other EHT collaborators (2014, A&A): In this picture you see simulation results where the jet as well as the black hole spin are tilted in various ways with respect to the observer (the jet and spin are always aligned here). The tilt is the same in every column, and every row represents a different magnification and wavelength of observations. You see that when the plasma is moving toward you, it appears brighter. This is relativistic Doppler beaming. There are various components to the image, including not only the disk but also the jet. If the disk was edge on, you would see a ring created by the jet (plus disk-to-jet transitioning matter) that is stricken through by the main disk. This corresponds to the right-most column. As you rotate more and more (but not quite) face-on towards the disk, there will still be a component of the plasma that ends up being strongly beamed towards you while the whole image starts looking quite a lot like a pure ring (left-most column). This is the current leading scenario for what EHT saw in M87. @RobJeffries Are you referring to the dragging effect or the tilt? The synchrotron emission still has a peak frequency and you can move closer or farther from it and see the plasma more or less (even though this is admittedly a smaller effect than, say, for a spectral line). The peak frequency also linearly scales with the "effective temperature" of the electrons. Even though the electrons are in fact non-thermal, assigning them a temperature is an acceptable simplification used even in most of the GRMHD models used to generate the EHT predictions. Please don’t delete it, but add a comment why it’s wrong. thank you for this! It’s not foolishness. The reason is almost entirely due to Doppler beaming and boosting of radiation arising in matter travelling at relativistic speeds. This in turn is almost entirely controlled by the orientation of the black hole spin. The black hole sweeps up material and magnetic fields almost irrespective of the orientation of any accretion disk. The pictures below from the fifth event horizon telescope paper makes things clear. The black arrow indicates the direction of black hole spin. The blue arrow indicates the initial rotation of the accretion flow. The jet of M87 is more or less East-West (when projected onto the page - in fact I believe the projected jet axis position angle should be more like 72 degrees rather than 90 degrees), but the right hand side is pointing towards the Earth, with an angle of about 17 degrees between the jet and the line of sight. It is assumed that the spin vector of the black hole is aligned (or anti-aligned) with this. The two left hand plots show agreement with the observations. What they have in common is that the black hole spin vector has a component into the page (anti-aligned with the jet), so that its projected spin vector is to the left. Gas is forced to rotate in the same way and results in projected relativistic motion towards us south of the black hole and away from us north of the black hole. Doppler boosting and beaming does the rest. As the paper says: "the location of the peak flux in the ring is controlled by the black hole spin: it always lies roughly 90 degrees counterclockwise from the projection of the spin vector on the sky." EDIT: Having read a bit more, there is a marginal (1.5 sigma) discrepancy between the large scale jet orientation, which should be at about a PA of 72 degrees (measuring to the right) from North in the observations and the deduced orientation of the black hole spin axis which is around $145 \pm 55$ degrees measuring from the same datum line. Sorry, I judged the geometry too quickly from the papers. Of course the whole picture is "on the side". You are correct and I was wrong. @0x90 please unaccept my answer and accept Robs if you find it satisfactory so that I can delete mine. @Void you could edit yours to explicitly say that it's wrong to avoid misleading the future visitors. Then, if it does become unaccepted (which it might not, depending on how active the OP is), it'd be possible to finally remove it. the black hole spin vector is into the page I'm confused by this. Isn't the black hole's spin vector to the left? Or do you mean that it has both a component to the left and a component into the page? @BenCrowell Its projected spin vector is to the left. The spin axis is assumed to be aligned with the jet. I'll think of a rewording. Given this, it looks like it's just relative location of the black hole to the light sources behind/around it. No - not like doppler effect. That illustrates lensing, but for (I think) a non-spinning black hole. Any asymmetry is caused by asymmetry in the background illumination. That isn't what is going on here. [SOLVED] Is it possible the space-time manifold itself could stop at a black hole's event horizon? [SOLVED] Can anything orbit a black hole with dipping under the event horizon? Can rotating black hole have toroidal event horizon with penetrating relativistic jet(s)? [SOLVED] Can the event horizon save conservation laws for black holes? Can a solid object inside the black hole event horizon avoid the singularity? [SOLVED] Why does a black hole grow when it consumes matter? Isn't this a contradiction? [SOLVED] What happens when an object passes through the event horizon of a black hole in GR?